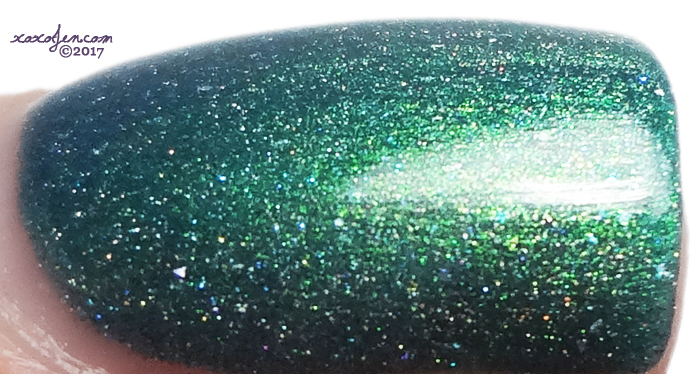 Ever After's One Song Glory was a NYC Polish Con Limited edition polish. I picked it up while there, and so glad I am finally getting to wear it! One Song Glory was inspired by a song from the Rent motion picture soundtrack. It's a tealish green with a subtle shift to purple. I can see it in the bottle, but failed to capture it in my photos. I wore two coats with topcoat, formula was fantastic as I've come to expect from Ever After. While this is not available at their shop, Ever After has an Event LE section in their store and there are some pretties to be had - hop over and take a peek!